So that's one quarter-finalist already in the draw. Who will the other seven teams be? There's text coverage of all the matches this weekend, including highlights across the BBC Sport website and app. Doncaster Rovers v Crystal Palace and Chelsea v Manchester United are live on BBC One and you can listen to extensive coverage on BBC Radio 5 live and local radio throughout the weekend. Matt Davis will be kicking off tomorrow's live with coverage of Brighton v Derby and I'll be back for the later games where Newport hope to defeat giants Manchester City. "We’re not far way. We are close, we just need the rub of the green. We have to keep working hard like tonight and eventually our luck will turn. "Five games ago we were talking about the play-offs, we need to get players back from injury and finish the season strong. "We have great supporters and we have to give them a team to be proud of and I think they were tonight." My favourite guy, Neil Johnston, has written a lovely report on tonight's game so if you missed any of the action, head over there to catch up. "I know all the games will be very hard. We knew Premier League teams have been knocked out against teams from other leagues so we knew this would be demanding game. "We try to enjoy every game and prepare. Now we are focused on the next game against Cardiff. "Our fans are enjoying the season not only with the Fa Cup but with the league as well. They can see the team giving everything and the results are coming." "We knew the game would be very demanding. QPR played very well and they had their chances. We took our first one and it was enough to win the game. "We tried to do this in other games and we didn’t score in the first moment with Tom Cleverley but we did in the second. "We tried to defend a little higher because with this team [QPR] there are a lot of second balls and it’s impossible to stop him [Matt Smith]. Heurelho Gomes played very well as well and we managed our line well. "Today the game was different because we have more time to play and recover for the next one. When I choose the first 11 I think it’s because they are best to complete that team. A reminder that Monday's quarter-final draw is live on BBC One from 19:00 GMT. If you're a Watford fan, you'll be wanting to watch that! I'm not sure there can be [any regrets from QPR over their approach]. It wasn't one of those games where they did enough to deserve to win. They were a bit blunt, they had a plan to get a knock down in the box and Watford dealt with it. I think they were still beaten by a better team today. Stefan Georgiev: FA Cup tomorrow and on Sunday: six ties, 12 teams, just 4 out of which are part of the Premier League. The magic is alive. Watford midfielder Etienne Capoue speaking to BT Sport: "I enjoyed the goal. It was teamwork. We worked all the way through the game. We are so proud. "Everyone is on the same page. The players give everything and they showed today what they can give on the pitch." 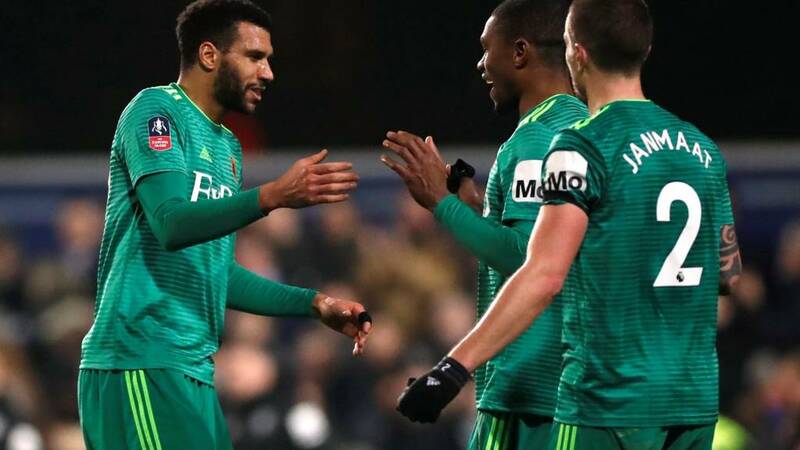 Watford striker Troy Deeney: "We didn't want to be the ones who went out. We got through and did it professionally. We were poor in the first half but had that bit of quality to score. "We were in control but weren't dominating or doing what we wanted to. We were sloppy at times. The character showed at the end with the way everyone dug in and the celebrations at the end. "We don't want to lose. We need to keep giving these performances. We are not playing that well but are grinding it out. In older days we might have lost this. "It is very cliche, but it is the next game and we keep this run rolling." It wasn't a classic, no doubt of that but QPR gave it their all and had the best of it in the first half before creating the best chance of the second half. It just didn't happen for them. QPR played well tonight. Hopefully they can take that kind of performance into the league and pick up a few more points. Watford are FA Cup quarter-finalists. Desperately want QPR keeper Joe Lumley to come up for a corner in the last second of this match. Superb from Troy Deeney. He chases the ball to keep it in on the corner, holds his ground and wins a free-kick. He'll run it into the corner flag now. Can someone save QPR in the closing stages? It looks like Watford are going to hang on. They are about two and a half minutes away from reaching the FA Cup quarter-finals.